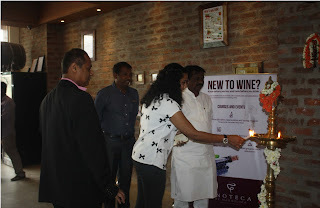 Bangalore, 11th September 2015: The good people of Bangalore love their wine. Over the years, the city has embraced this beverage with open arms. More and more people are keen on understanding its nuances and its journey from grape to wine. Stocking an amazing collection of wines, Enoteca by Madhuloka has decided to take things further with its wine education programs. The latest program to be added to its roster is the Wine Education, Appreciation and Tasting (WEAT), endorsed by the Karnataka Wine Board. This program was formally inaugurated by Shri. 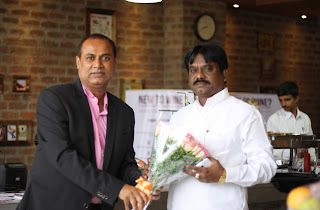 Bakkappa Kote, Chairman, Karnataka Wine Board and Dr. Krishna, Managing Director of the Karnataka Wine Board on September 11th, 2015. Speaking on the broader benefits of this course, Dr. Krishna, Managing Director, Karnataka Wine Board said, “This course will help drive effective sales in the wine industry, since it encourages the growth of wine culture. Karnataka Wine Board and Enoteca are committed to taking this course to other tier 2 cities of the state, thus increasing. WEAT is a comprehensive course that spans 8 hours. It blends together the science, art and philosophy of wine, going over all the important nuances of the beverage. Participants will taste approximately 15 wines in this course and will be taught to analyze and appreciate wine. Attendees will be provided a handbook or study material and will be awarded a certificate at the end of a short multi-choice question paper. The course is priced at Rs 3600 only per person AI. The first batch will begin on September 20th. Takers for the first batch will be offered a discount of 20%. The course is designed and will be conducted by Gaurav Thapar, who comes from a wine making background. He received his education and training in wine production from Lincoln University, New Zealand. He is a WSET (LONDON) level 2 holder, having passed it with distinction.